This is supposed to be a common avian species, ranging widely in our islands. But I seldom see it, much less photograph it well. To catch it in the air is one of my obsessions, given the difficulty of acquiring the bird during its short flight from tree to tree. Each time I see one foraging in a treetop, I wait with full anticipation, hoping that it flies towards my position. This morning, I was fortunate to be granted my wish. With the plain sky as background, my BIF workhorse had no trouble catching it in the middle of its undulating flight. Habitat - Common in trees in open country, gardens in towns, and open scrub in the lowlands. 400 mm, f/5.6, 1/2000 sec, ISO 320, manual exposure in available light, hand held, major crop resized to 800 x 533. 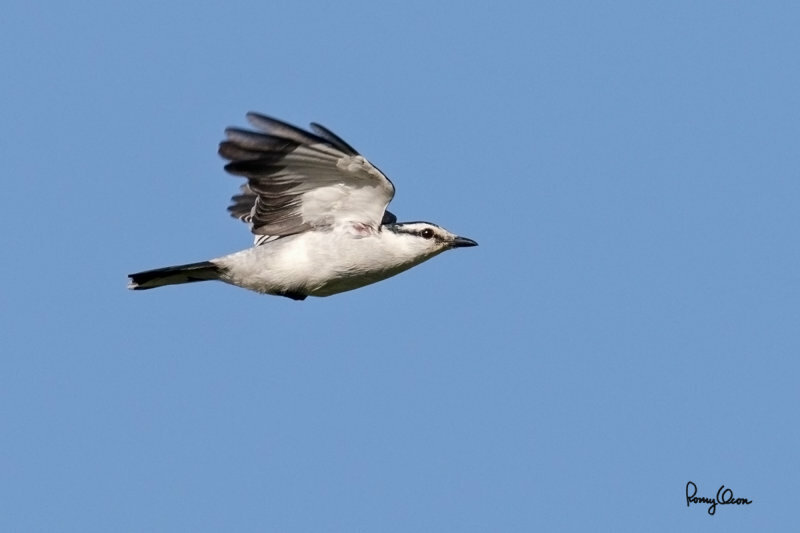 This is an awesome capture of the Pied Triller in flight!